From the design phase to construction and installation, EC Buildings delivers the most cost-effective and quality solution for your unique application. From design to delivery let the industry experts at EC Buildings help you plan, build and deliver your portable building or modified shipping container. NIX EC Buildings can be fabricated from scratch to your specifications or we can take existing steel containers and modify them to fit your needs. EC Buildings focuses on delivering custom fabricated metal buildings and products constructed from quality materials to provide a cost effective solution. With a Portable Steel Building constructed by EC Buildings, customers are able to solve all of their mobility constraints due to the heavy-duty materials used. Our portable metal buildings are constructed with a far superior designs compared to others on the market. They have the capability of being set several stories in the air or dragged for miles through the mud. Unlike traditional construction, with our portable buildings, your project can be operational in weeks instead of months! Used or new shipping containers can be completely customized to fit your needs. Whenever or wherever you need space, we can customize a metal shipping container to meet your needs. Because there is no “one size fits all” solution, we work closely with our customers to ensure all of their requirements are fully addressed during the design stage. Our in-depth experience provides a solid foundation for incorporating a wide range of options. 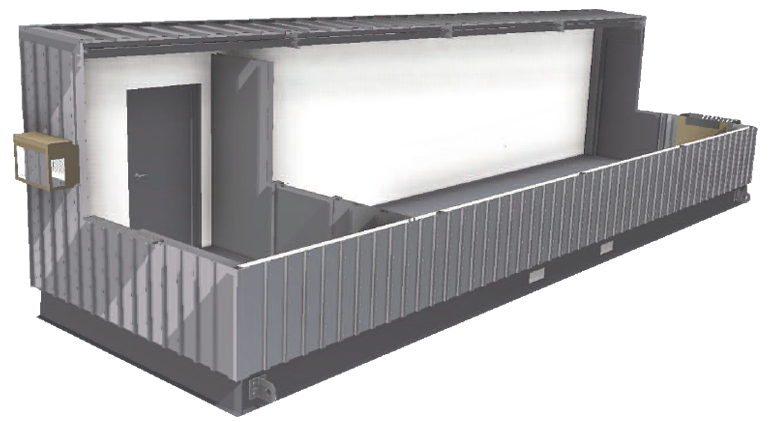 The result is a customized shipping container solution that focuses on minimizing the impact of downtime and maximizing productivity without requiring a high cost to own.